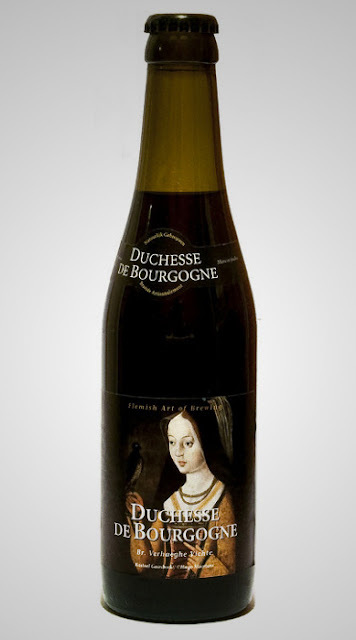 Duchesse De Bourgogne (6.0%): I don't review beer regularly on the blog but this incredible brew definitely deserves to be treated specially. It has been always one of my favorite Belgian beers. I was lucky enough to have a few bottles at home and wanted to share my notes here. Duchesse de Bourgogne is named after the daughter of the Duke Of Burgundy, Mary, born in Bruges. It is a Flanders Red style ale brewed by Brouwerij Verhaeghe in the city of Vichte in West Flanders. After it's first and second fermentation using deep roasted barley malt and hops the mash is transferred to oak barrels for a third fermentation where it spends 18 months. At the end of this period the beer is blended with it's younger, 8 months old expression before being bottled. Look: Something in between maroon and damson plum color. It fades to a deep ruby red glow towards the rim of the glass when hold against the light. Almost like a halo... Rather quickly disappearing thick and creamy russet head. It leaves some persistent lacing on the glass. Nose: Sour goodness..! Sweet, high end balsamic vinegar... Sour cherry juice, pomegranate molasses and fresh red berries. After allowing it air a little tawny port aromas fills the glass. One of the best beer noses I ever had. Palate: First attack is sour, tart and fruity: sour cherries, damson plum, fresh cranberries, fresh quince, medlar and sour green apples. After drying your mouth entirely the second wave shows up with more complex, settled and mature notes: cask aged red wine, molasses and dark chocolate. Probably I was under the influence of the label but I am pretty sure I got some cremant de bourgogne notes as well. Overall: Like I said one of my favorite brews of all time... If you see this bottle anywhere you have to try it, no second thoughts there. But if you happen to be one of the rare very lucky ones there is a possibility you might find it on tab in some fancy beer bars. Keep it to yourself and make that place your regular joint.